These tools & gadgets are ones I find helpful to use. I am not being paid nor have been asked to promote these for anyone. All opinions are my own. Do you struggle with turning tubes, handles or ties? Are you hands like mine with increasingly arthritic fingers that ache when doing fiddly work? I recently discovered these tube turners and find them really helpful, also I don't snag or make holes at the ends of the tubes like I have in the past when using pins or the long hook tools. So easy, stitch the tube, slide it on the hollow plastic tube, then push from one end with the dowel or metal down the tube and easy, peasy, a turned tube. They come in 3 sizes in the one pack, including the plastic hollow tubes as well as the appropriate sized dowel or metal rod. This one is a recent discovery and already proved a winner. I have always struggled to join the ends of the binding around the edge of the quilt to give a neat finish without puckering. All the hints and tips I've read never seemed to work for me, they were fiddly, and I would revert to overlapping the ends then hand stitching them closed. However, this all changed with the binding tool. I did have to re-watch the You tube clip showing how to use it, but once I had, finished binding 3 quilts in a flash. These clips come in 2 sizes, I use the regular size but they are also available in a jumbo size. 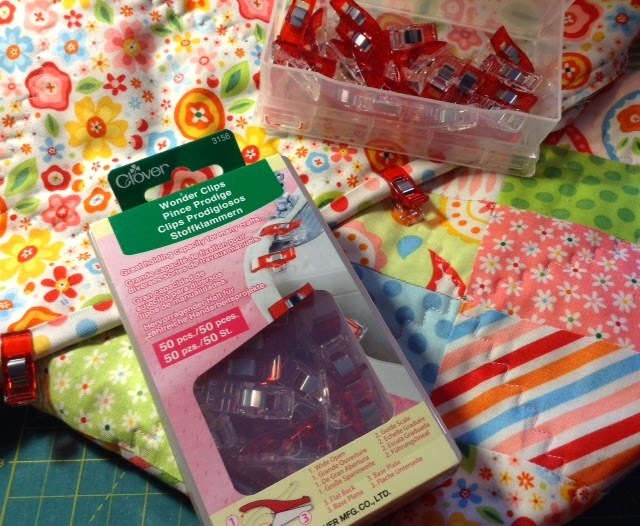 Lots of uses really but I am finding them fantastic for clipping around the binding of a quilt to secure it while hand stitching. I really didn't think I would find them that helpful as I've never been one to clip things down, but they have made it sooooooooo much easier, again for my fingers and hands - much less pain now when binding. Seemed to make the process quicker as well. I have also used them to secure two edges together when making a name badge recently - they kept the folded edges turned in and taut while I was sewing the badge. If you want to look at these tools, I suggest you google them to find the best place to purchase them for where you live. There are also You tube clips on each of them showing how to use them.